I've never really gotten all the hype about the Bachelor...until now. This season I've coincidentally been on the elliptical each Monday at the precise time to enjoy the circus that is the Bachelor's search for his "one true love." Now I'm totally addicted and have told the DVR to capture them all. 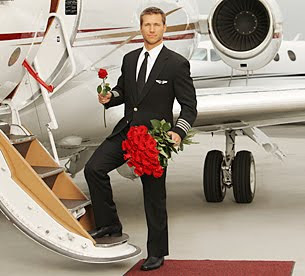 This season's Bachelor, Jake, is an immensely attactive (but rather cliche-looking) pilot from Dallas. Obviously everytime I leave the house I now look for that perfect face around town. No luck yet. Given his aviation career and self-proclaimed "romance with the skies" the season has been titled The Bachelor: On the Wings of Love. With a name like that, how could there be not be fabulousness? I have a couple knocks on Jake. He is so incredibly cheesy. He referenced "following his heart" over 10 times last night and said things like "I have butterflies right now knowing my future wife is in this room" and "you're such an amazing person, but our chemistry is just not what I'm looking for in my soulmate and mother of my children." I find it giggle-tastic, but manfriend (who now has to watch since Monday night football is no more) just cackles in awe at these statements. My other knock on him is that he tears up way too much. Last night he sent 4 girls home when he only was supposed to send 2. Each one cot their own feaux watering eyes. His explanation is that he didn't want to "waste a single second on a lady that isn't my soulmate." Give me a break. I'm all for a man showing his emotions but this is just to far. I won't hold any of this against him because he's smokin' hot. A weakness of mine that has gotten me in trouble in my real life. And the girls. They're all so ridiculous. All of them are attractive and are a catch by anyone's standards. I don't know why they're all fighting over this person. Clearly I know it's all for T.V., and its worked on me quite well, but I forget that it isn't actually 'reality.' They all get "so jealous" when he takes another one on a date. They BARELY KNOW HIM. And they all say the comment "I'm totally falling for this guy" in their interviews. Give me another damn break. Nonetheless, I just can't get enough. My early prediction of the winner is Tenley. She's sweet as pie, isn't a backstabber and "came to start the journey that will be the next 60 years of her life." If she doesn't win I hope she's at least the next Bachellorette. There is only one left at this point that I despise. Her name is Vienna. She's ugly, vindictive, mean, immature and only wants a T.V. career. She infuriates me. Jake is still drinking the kool-aid for some crazy reason. Note: I am aware that she isn't on trial to be my soulmate, but it feels like it sometimes, I've really invested a lot in this Jake person. Sad. Update on the Prince: He is alive and kickin'....well sort of. He came out of surgery sucessfully and now has 15 staples in his belly. He's also shaved on his whole underside. Therefore, he can't run/walk/jump/play until Saturday when he gets them out. He has to wear a conehead and little poodle jammies at all times. This has been a challenge to say the least. The official problem with the little guy is that he has mild Inflammatory Bowel Syndrome. This requires a mere change of diet. Man, what an ordeal. He is also now accepting donations to his medical debts. I'm trying to book George Clooney for a telethon. VIVA CHUY! Love the post. I'm betting on Ali and Tenley. Si Se Puede Senor Chuy!